With increasing legalisation of cannabis for medicinal and research purposes, demand for accurate and high throughput analysis of its active ingredients has dramatically risen. Cannabis plant material contains several cannabinoids for which the human brain has evolved receptors. The two most important are the psychoactive THC and the analgesic CBD, which has therapeutic uses. The ratio of THC and CBD is crucial for differentiating medicinal versus recreational cannabis. This ratio is important for taxation authorities, medical regulators and growers alike. Accurate determination of the THC/CBD ratio is critically determined by effective sample preparation of the samples of cannabis leaf, bud and flower. Traditional sample preparation methods have used bead-beating or grinding mills to homogenise these materials. When conducted in polypropylene microplates the extreme forces applied by these machines often cause damage to the plates leading to cracking, leaking and ultimately, cross-contamination. Porvair Sciences has applied modern design concepts and mould analysis to this problem to create a solid, stable and strong microplate that can withstand the applied forces in bead-beaters whilst maintaining a standard ANSI/SLAS footprint and key dimensions. By adding reinforced walls to the bottom of the well and backing these with supporting ribs on the underside of the plate, the company has produced a 2ml square well block (Plant Genomics plate) that can be used safely and with confidence for cannabis plant extraction. The Plant Genomics plate has a generous working volume of 1.90 ml per well in a 45mm high plate. 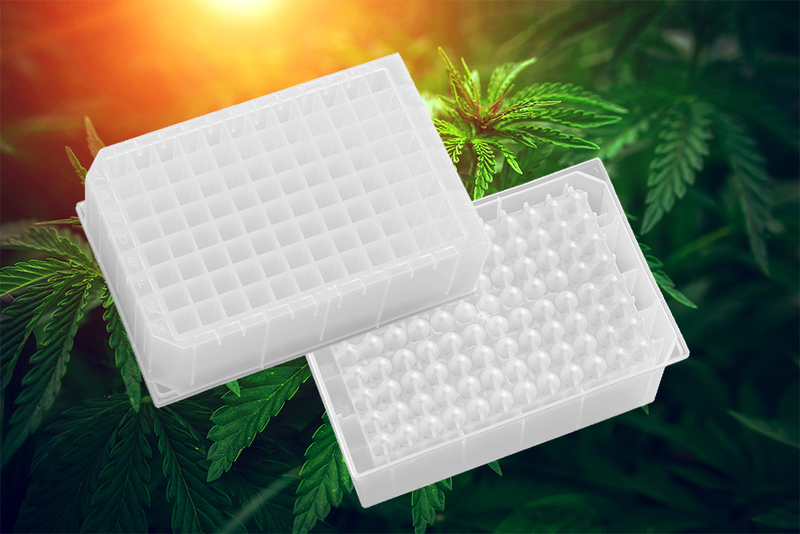 The polypropylene used to mould the plate is pure, virgin, extractable free polymer, rigorously tested for leachates thereby ensuring no contamination from the plate will affect THC/CBD analysis. In the described protocol, sample preparation using the Plant Genomics plate in a GenoGrinder takes just two minutes. Following this, the dry ground cannabis powder is transferred into the wells of a Porvair P3 filter microplate for extraction under agitation with methanol or isopropanol to dissolve the oily residues in the plant material. After agitation, the P3 plate is placed onto a Porvair Microlute manifold and vacuum applied to draw the purified extract down through the filter and into the wells of a collection plate. The collection plate containing the organic extract is then taken for HPLC analysis to determine the THC/CBD ratio. To determine total THC and CBD in the Cannabis plant sample, the purified extract should be gently evaporated to dryness using a Porvair MiniVap blowdown evaporator. The sample should then be redissolved in a known volume of solvent ready for HPLC analysis. Both methodologies are reported to be straightforward and repeatable.